Alyssa De La Sala at her lemonade stand. TAMPA, Fla. (WLS) -- A 10-year-old girl in Florida is taking it upon herself to raise money for her family after their home was damaged in a fire. Alyssa De La Sala set up a lemonade stand then went on a local radio station to ask them to advertise her business. Little did she know, the station asked Tampa affiliate WFTS to also help. Alyssa and her family were shocked by the community's support. "I am speechless, overwhelmed," Alyssa said. "It is amazing." In her wildest dreams, Alyssa never imaged the crowd would be so large at her Lutz lemonade stand that officers would have to direct traffic. A fire not only destroyed their home two years ago, but the family says a builder never completed the work, leaving them to pick up the pieces. Alyssa, heartbroken seeing her parents suffer, set up the lemonade stand to help rebuild her family's home. Her lemonade stand she set up with her brother Damien also featuring home-baked goods brought people from as far away as Hernando County. The family has been overwhelmed by the generosity of strangers. 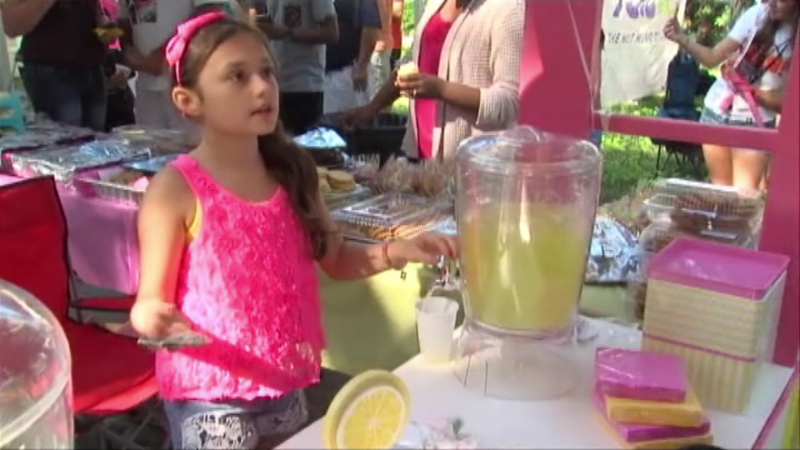 One person gave them $500 and another gave $1,000 - just for a cup of lemonade. "Anything beyond what I thought would happen," said Joe De La Sala, Alyssa's father. Not only did even strangers give, the first responders to the fire showed up in support. Deputies reached out to businesses and countless came through with boxes and boxes of supplies. "We knew we had a good community, but when you just see everyone here it is really overwhelming," Jenn De La Sala said. All this because of one little girl, whose motto "when life gives you lemons, make lemonade" really may have saved her family. "We are very proud of her," Jenn De La Sala said. "Thank you for your support, everything counts and helps us get home," Alyssa said. Alyssa made almost $15,000 for her family between a GoFundMe page and one day of lemonade sales.